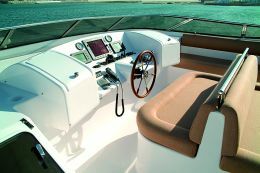 Has been presented during the last Boat Show in Dubai. The Majesty 88 built by the U.A.E. Gulf Craft ship yard has attracted much success throughout the event thanks to which the third model of this line has been scheduled for imminent delivery. Classification: RINA 100-A1. 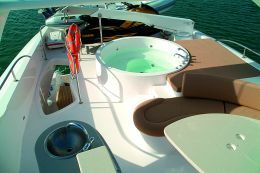 1 "Y"
For further information contact: Majesty Yachts ; P.O. Box 666 Ajman, U.A.E; tel. 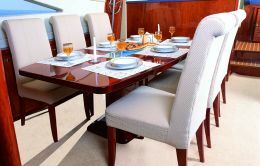 +971 67406060; fax +971 67406062; web site: www.majesty-yachts.com; e-mail: info@majesty-yachts.com. The leading United Arab Emirates ship yard manufactures luxury yachts from 44 to 130 feet. During the Boat Show in Dubai three 88 ft. have been sold which is a very encouraging result for the ship yard that has successfully moulded many technical choices and modern designs into their yachts that have a typically European flavour. The material employed as in all the production lines of Gulf Craft is composite for both hull and superstructure. The design of the Majesty 88 is the work of the yard's team, that have been careful to convey those stylistic lines that appeal to the international market in such a way as to highlight that family feeling through the whole Majesty range of luxury yachts. The result is well balanced, pleasant looking, with no stylistic exasperation. The project is that of a classic design with three decks and a fly. The lower deck hosts the guest cabins and owner's suite in the forward portion of the deck beyond the centre area, while beyond the large engine room towards the stern there are two cabins with one bathroom in common for the crew and well equipped galley with separate access from the cockpit. The full beam owner suite situated just forward of mid-ships is very bright thanks to six vertically installed oval shaped port-holes three of which on the port side and the other three to starboard. 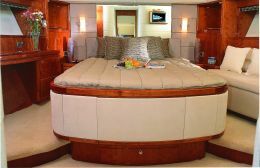 The resulting ample space is taken up by a sofa to port , a writing / dressing table on the starboard side, while the bed occupies the central area behind which on the port side is a large bathroom with separate shower and a large wardrobe dressing area opposite to starboard. The first guest cabin with twin beds and en-suite bathroom is situated further forward on the port side. To starboard there is another guest cabin with twin beds en-suite bathroom and shower. The VIP cabin is situated forward of the preceding two guest cabins. It is furnished with a double bed, sofa, dressing table and en-suite bathroom. 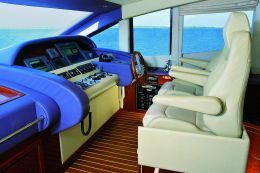 The main deck is entirely dedicated to relaxing inside except for the bow area which to starboard houses the wheel house with the electronics, and accessories required for extensive blue water cruising even in the most trying conditions. 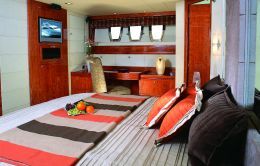 To port of these we find a C shaped sofa and table that allows one to enjoy a bird's eye view of the course underway as from the wheel but in relaxing, and comfortable surroundings. Toward the stern we find the dining area to port which is made up of a table for eight placed in a bow to stern arrangement while the starboard side is equipped with a day bathroom and complete galley with ample built in storing space. 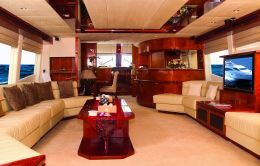 The central area of this deck is entirely designed for the saloon which comprises a large sofa to port another to starboard and a huge video screen which disappears at the touch of a button, coffee tables complete the layout. This area is very bright thanks to the ample glass panelling surrounds along the sides of the superstructure that as already mentioned take after European models and more particularly the Italian ones with a view to mould slim lines and spacious interiors to generate the wanted comfort. The final outcome seems positive in as much both the aesthetical aspects and the ample spaces aboard witness the fact that the ship yard has successfully managed to deliver the results required by management. 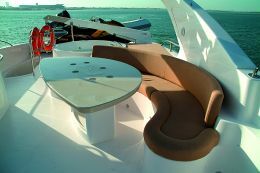 The generous cockpit area which is entirely covered by the extension of the fly deck above, comprises a sofa /locker at the stern and ample space to lunch in the open in the shade, away from the sun. Access to the cockpit comes in the way of two moulded teak lined stairways placed singularly on each side. The fly deck is geared to host two different tenders, namely one inflatable with a rigid keel as well as a water craft, a circular shaped hydro massage pool, a sun bathing area, a C shaped sofa and centrally placed table, a drinks bar, a wash basin. Two different layouts are available as optional; one of which places the large galley on the main deck rather than on the lower one. As for the more purely technical themes, the hull and superstructure are made of closed cell lightweight composites to contain weight given the yacht's potential and structural solidity. As for the range of accessories installed principally from Europe and the United states of America, all of good quality thus highlighting the fact that the yard has been generous in the choice of the on board equipment. The choices of the engines are as many as three, the first one: two Caterpillar engines of 1,550 HP each, the second two Caterpillar engines of 1,800 HP each while the third solution is: two MTU 16V 2000 TE91 of 2,000 HP each. In each case a ZF transmission drive unit with five bladed propellers are foreseen. 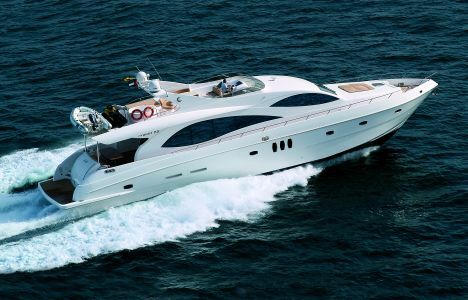 The yacht boasts a complete electronic monitoring system of the tanks, hydraulic and electrical systems, engines, smoke detecting sensors, gauges to monitor waste water levels, all to ensure complete control of the yacht. The U.A.E ship yard is surely working to attract new owners, the recipes shown seem adequate enough to do just that, and the potential public interest is very present, so much so that the Majesty 88, in spite of its young age has already reached the third model of its kind.